Quite a number of non-fiction books deal with grief. Only very few focus on the disappearance of a loved father, mother, brother, sister, child or friend. But this phenomenon – in the past experienced mostly as a consequence of natural disasters or the vanishing of sailors – has become a widespread and terrifying occurrence, if not a strategy in a rising number of military and political conflicts all over the world. “Grief and Disappearance” addresses all those who encounter human beings with a respective loss or trauma, one way or the other: not only psychotherapists, but also physicians, school teachers, civil servants, social workers, interpreters and last, but not least all those volunteers who work with NGOs, religious groups or communities in order to help often traumatized refugees to find a new, safe home. Barbara Preitler is an expert on trauma therapy, with a long experience with survivors of violent conflicts and, in particular, victims of torture. She teaches at a number of universities, and has considerable field experience, eg in Sri Lanka where she has helped to establish an academic trauma counseling program after the 2004 Tsunami. She has written a number of widely acclaimed specialist books, but most of them had not been published in English thus far. First, the author provides the reader with a theoretical background – but one should not be afraid: the book is well-written, and very useful also for non-professionals. Beginning with mythological roots in many cultures (eg. Penelope’s waiting for her husband Ulysses), Preitler makes mention of disappearances of soldiers (“missed in action”), of the search for surviving relatives after a war, of refugees and migrants on their often long and arduous journeys. She embraces a wide range of aspects, from the historical dimension to the actual situation in an appallingly increasing number of countries: she emphasizes that “enforced disappearances” have become a form of systematic violations of human rights. Preitler describes the dismaying state of survivors, caught between searching, despair and resignation. She speaks of the need for certainty (eg. exhumations), and the desire for justice. She mentions new forms, eg. truth commissions – following the relatively successful South African example – as important political, but also social and psychological steps in the process of coping. She brings up the wish for real, or at least symbolic or virtual memorial places. She speaks of rituals, and collective forms of coping, e.g. the “Mothers of the Plaza de Mayo”, in Argentina, who are described as a role model for many other associations of relatives elsewhere. 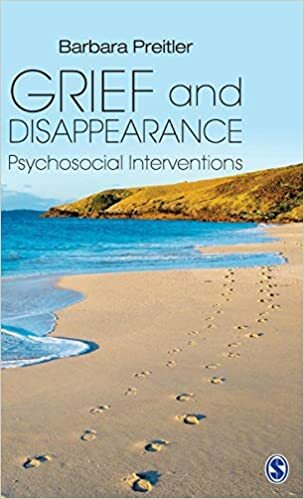 She touches upon the particularly traumatic experience of a loss during childhood, of actual and possible children’s strategies for coping with grief, and the need to tell them the truth at a certain moment in time. The last, but not least important chapters of the book are dedicated to the practice of psycho-therapeutic work with traumatized people. Preitler emphasizes the importance of safe counseling relationships, the careful steps, short- and long-term interventions during and / or after a personal catastrophe. For the most part, the book does refrain from speaking of healing: the author defines the scope, the possibilities, but also the limits of trauma therapy, e.g. the necessity at times to accept the irreconcilability. Preitler spans a wide bridge, from the theoretical bases to many practical examples during decades of her extensive experience. All-in-all, the book is a well-written and tremendously useful compendium.